Elizabeth Poliner is the author of As Close to Us as Breathing, a novel (winner of the 2017 Janet Heidinger Kafka Prize in Fiction and an Amazon Best Book of 2016); Mutual Life & Casualty, a novel-in-stories; What You Know in Your Hands, a poetry collection; and Sudden Fog, a poetry chapbook. Her short fiction and poetry have appeared widely in literary journals including the Kenyon Review, The Southern Review, Michigan Quarterly Review, and Colorado Review. 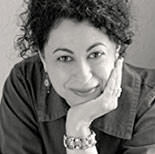 She is a recipient of seven individual artist grants from the D.C. Commission on the Arts and Humanities, fiction fellowships to the Wesleyan and Sewanee writers’ conferences, and artist residencies at the MacDowell Colony, Yaddo, the Wurlitzer Foundation, and the Virginia Center for the Creative Arts. She teaches creative writing in the MFA and undergraduate programs at Hollins University where she is an associate professor. and we talk. Or I do, and they seem to listen. hello, sweet to see you. that leads to the horses.